A Wisconsin landmark gets a makeover. Two years in the making, renovations at Milwaukee&apos;s Mitchell Park Conservatory — the Domes — are complete. "When people come back, they&apos;re going to be kind of blown away, seriously," says Milwaukee County Parks Director Sue Black. 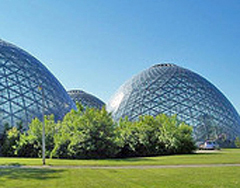 Black says the forty year old Domes needed a lot of attention. "I make a joke that the last time I was at the Domes I was 12 and I got off the bus," says Black. "You could tell that they needed to be reinvented. The needed a facelift, and they needed to appeal to this generation." Part of the reinvention includes being open evenings – until 7:00 PM Monday through Thursday – and the new hours drove the focus of the renovations: new, state of the art lighting. The privately funded project includes a specialty LED lighting system in the Show dome. The other two domes, Arid and Tropical, also got new lighting, as did the lobby. Black&apos;s favorite time to visit the Domes? In the middle of a hard Wisconsin winter, of course.